You can add volumes of photos to Photoshop Elements 11 from not only scanned images and CD/DVDs, but also digital cameras, cell phones, and tablets. In the early days of Adobe Photoshop, circa early ’90s and later when Photoshop Elements arrived, most photos were acquired from scanned prints, scanned slides, from some point-and-shoot cameras, and occasionally from images stored on CDs. At this point in your digital life, you probably have more data stored on computers from photo and other media files than any other document types. Other media, such as text documents, layouts, and spreadsheets, can often be easily reproduced. However, photos, once lost, are gone forever. If your photography is important to you and you have substantial numbers of images stored on a hard drive, you may want to look at acquiring a dedicated hard drive just for your photos. With prices dropping on large drives of 1/2 to 2 terabytes, you can pick up an additional drive and attach the drive to your computer. Use the drive for storing your photos only and keep all other data away from the drive. Photoshop Elements offers you some backup options to store images in the cloud (a remote server) on Photoshop.com. But the free service is limited to 2G of data. These days, you can shoot 2G of photos in a single photo shoot. All the free services you find aren’t going to provide you with enough storage space if you’re a serious photographer. For backup purposes, it might be best to purchase a second drive for your photos. Two 1-terabyte drives will serve you well for media storage and backup. The Photoshop Elements Organizer is a marvelous tool for managing photos. But before you start working in Elements, it’s a good idea to look at where you store photos on your hard drive. 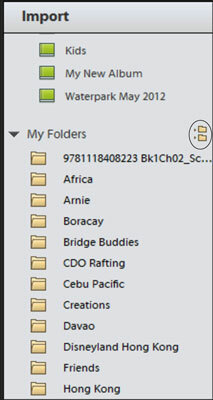 Create folders in a hierarchical order with folder names that represent logical divisions for where and when photos were taken. It’s your call for how you want to develop the hierarchy. You might want to create separate folders for each year and inside those folders divide the images into other folders for family, business, events, occasions, and so on. How you segregate the images is a personal choice. Just be certain you keep the organization consistent and logical for your personal needs. When you get into the Organizer, you can use the marvelous viewing option for finding photos on a hard drive. As a matter of fact, the folder organization has become a default view in Elements 11. Prior to Elements 11, you had to choose a menu command in order to see your photos organized in folders in a sidebar that shows you an Explorer-type view (Windows) or Finder-type view (Macintosh). In this version of Elements, you see an Import panel and a list of folders where your photos are stored. For a more traditional Explorer/Finder type appearance, you can change the view by clicking the icon in the Import panel. The view changes to a hierarchical view. To return to the original folder view, click the X in the top-right corner in the Import panel. Think about how you want your folders on your hard drive organized and create a structure that you can understand so that you can easily copy photos to the newly created folders.